do I put in a tablet while shocking the pool? After schocking the pool, how long before it can be used? It will depend on what your chlorine level is in your swimming pool. Its always best to check all the chemicals before anyone goes swimming. You can use Aqua Check Strips to test or a basic Pool Chemistry Test Kit. We are new pool owners and have been fighting a green algae problem for a few months. After being away for a month we came back to a pool that looks like green slime, after two weeks of treating the pool it is still a thick green colour. I have maintained the chlorine and PH level, hoovered once and shocked once. Even after the shock the pool maintained the green colour. We are in a very hot country which aids the algae growth. Our next plan of action is cleaning filter and backwashing, shocking again and leaving filter running and then possibly adding algaecide. Any advise that you can give us would be very appreciated. Can I shock a pool when it’s raining a little? Do I have to adjust the PH levels first before adding shock? Hi- We are in the country…and we initally got water from the city to fill the pool, but we did use some from home. The well water is full of iron. The water is a brownish/green hue and there is really fine sediment on the pool floor. I have checked the pH and clorine levels. Both are just fine. What else do I need to do, or what else can I do to get rid of the iron and get this pool clear again. Please help!!!!! 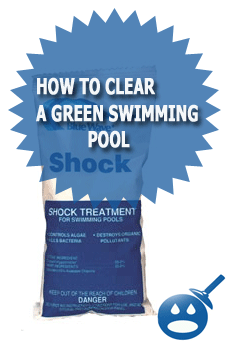 I have pool “shock” but the directions are unclear how much to use. The pool is above ground, 3100 gal of water. THanks! You can do online or to a home center and buy “iron out” its a chemical made to remove the iron from the water. They make it for pools and large bodies of water, Head down to a lowes, home depot, or a pool supply center and they will be able to give you a product to remove the iron. In fact I think Walmart might even have an iron out as well. 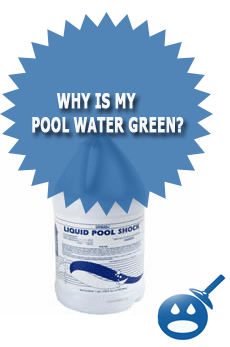 Pool shock will not remove the iron, That will only destroy the algae. BUT with all that iron in the water the filter is going to just keep gunking up etc. I filled a 3700 gallon swimming pool with our well water which is VERY high in iron. After 1 foot of water in the pool, you couldn’t see the bottom. After it was filled, I thought I had made a huge mistake. On a whim, I went to Home Depot and bought 2 household canister filters and put in carbon filters. I hooked these up to a sump pump which I set in the pool. I let it run overnight, and I almost fell over the next morning when I went out and you could have drank the crystal clear water. It was about a $40 fix, but I already had the sump pump sitting on the shelf in the garage. Let me know if you need instructions on hooking this contraption up. Just wondering if you can put chemicals in your pool even though you haven’t had your filter/skimmer installed yet? The guy that was setting it up just left and never came back! We recently bought a 12 x 33 easy set up pool for the kids. The guy at the store told us to use pool salt instead of cholorine, that it was better. The pool is 1590 g. of water, we have added about 12 cups of the salt, as per his instructions. Its only been two weeks and the pool is cloudy and a greenish colour. I dont think there is enough salt in it. Should we add more salt? Can we use anything else with the salt like a pool shocker or can we switch to cholorine? We have a 16 x 42 intex pool and our instructions said 95 lbs (95 cups) of salt for our pool so yours definately needs more salt! According to my pool manual…your pool needs about 38.75 cups of salt. We also shock our pool once a week to keep algae at bay. 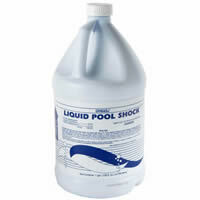 Make sure you pre-mix your shock with some pool water in a container so you do not cause damage to your liner!!! Find a local pool store and have them test your water for you, They always help us find what we need. GOOD LUCK! is there anyway to “treat” this burned looking area? 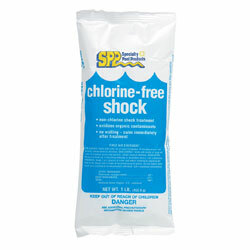 we used 3 bags of shock – which is what we normally use – any ideas? 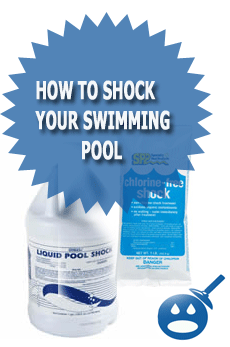 It is possible that you could have burned the liner, There are two different types of swimming pool shock. The “Tri-chlor” will not break down when directly added to the pool and always needs to be mixed in a bucket of water before adding it to the pool or it can be added through the filter system on re-circulate. Cal-Hypo shock will usually break down faster but should also be mixed. 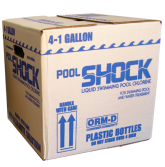 Many brands of pool shock now have a label that say; “Vinyl Pool Safe”. Try to look for that label when buying shock in the future. Is this the same type and brand of shock you normally buy? But ya, Sounds like you burned the liner for sure. That’s great news that the stain is getting lighter !! Enjoy your pool and let me know if you need any thing in the future. Do you need to brush the walls before or after adding shock? 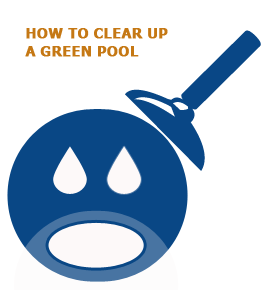 Brush your pool first, walls and floor- once the algae is agitated, add the pool shock. This will help ‘kill’ the algae while it is suspended in the water. Much more affective than brushing, after the shock has done its work. Hope that helps. My neighbor has an above ground pool. No kids swim in it, just her occasionally and then she just lays on a raft. Does the pool have to run for 24 hours when she shocks it or can it be done for several days? Is shocking it a substitute for cleaning it?